Hitting the electronic surplus shop is probably old hat to most of our readership. Somewhere, everyone’s got that little festering pile of hardware they’re definitely going to use some day. An old fax is one thing, but how would your partner feel if you took home an entire pallet-sized gene sequencing rig? 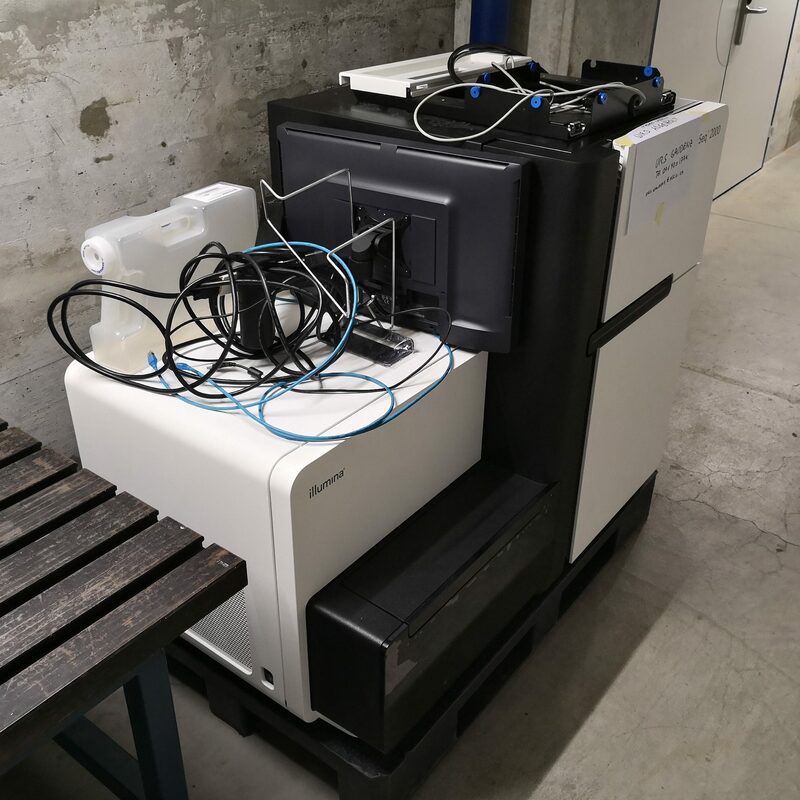 Our friend [kaspar] sent along an interesting note that the folks at Swiss hackerspace Hackteria got their hands on an Illumina HiSeq 2000 last year (see funny “look what we got!” photo at top) and have generated a huge amount of open documentation about whats inside and how to use it. Okay first off, what the heck is this machine anyway? The HiSeq is designed to automatically perform the sequencing step of Illumina’s proprietary multi step gene sequencing process (see manufacturer’s glossy for more), and to do so with minimal human intervention. That means that the unit contains a microfluidics system to manipulate samples, an extremely high performance optical scan system complete with controllable stage, imager, fluorescence modes, etc, and lots of other things this author isn’t sufficiently trained to guess at. 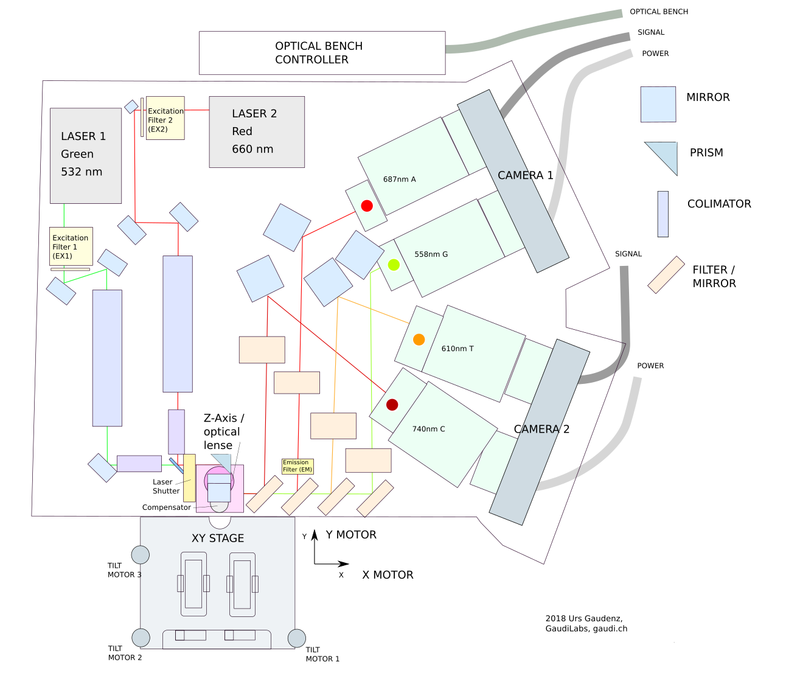 The folks at Hackteria have done a pretty thorough teardown of the system and produced block diagrams of most of its modules. They’ve also run some of the tools and recorded logs of what they were up to, including the serial commands sent to and from the machine to control certain subsystems. Of course a tool like this was meant to be driven by Illumina’s specific software, but unusually those are available and surprisingly usable which is how the aforementioned logs were captured. Right now it looks like Hackteria has put together tools to use the system as a fluorescent microscope. Oddly the most interesting thing here might be how available these systems are. It appears that they’re being replaced en masse and have become easily available in the range of thousands of dollars on the secondary market. At that price point they’re almost worth snapping up for the enclosure and parts! But we prefer Hackteria’s goal of enabling the Citizen Scientist to make use of these incredible machines for their intended purpose. Who knows what exciting projects we’ll find when hackers start sequencing their cats! Thanks for the tip [kaspar]! We’ve always been fascinated at the number of ways logic gates can spring into being. Sure, we think of logic gates carrying electrons, but there are so many other mechanical means to do the same thing. Another method that sometimes has a practical use is fluidic or pneumatic logic. We guess [dAcid] has a similar interest since he’s written two posts on how to construct the gates. One post covers making them with ordinary tools. The other requires an SLA printer. According to [dAcid], the design is effectively the same either way, but the SLA printing is more precise. Silicone is an important component, either way. Fluidic logic has applications in some mechanical systems, although digital logic has made it less important than it once was. However, it is very possible that nanotechnology systems will implement logic mechanically, so this is still an interesting technique to understand. You can see videos of how a D latch looks using both methods, below. The idea of using nanobots to treat diseases has been around for years, though it has yet to be realized in any significant manner. Inspired by Purcell’s Scallop theorem, scientists from the Max Planck Institute for Intelligent Systems have created their own version . They designed a “micro-scallop” that could propel itself through non-Newtonian fluids, which is what most biological fluids happen to be. The scientists decided on constructing a relatively simple robot, one with two rigid “shells” and a flexible connecting hinge. They 3D-printed a negative mold of the structure and filled it with a polydimethylsiloxane (PDMS) solution mixed with fluorescent powder to enable detection. Once cured, the nanobot measured 800 microns wide by 300 microns thick. It’s worth noting that it did not have a motor. Once the mold was complete, two neodymium magnets were glued onto the outside of each shell. When a gradient-free external magnetic field was applied, the magnets make the nanobot’s shells open and close. These reciprocal movements resulted in its net propulsion through non-Newtonian media. The scientists also tested it in glycerol, an example of a Newtonian fluid. Confirming Purcell’s Scallop theorem, the nanobot did not move through the glycerol. They took videos of the nanobot in motion using a stereoscope, a digital camera with a colored-glass filter, and an ultraviolet LED to make the fluorescent nanobot detectable. The scientists did not indicate any further studies regarding this design. Instead, they hope it will aid future researchers in designing nanobots that can swim through blood vessels and body fluids. We don’t know how many years it will be before this becomes mainstream medical science, but we know this much: we will never look at scallops the same way again!